End users have to deal with an increasing volume of communications: phone calls, voice mails, text messages, faxes, emails, instant messages, and web, voice and video conferences. It is difficult to manage and make best use of all the different enterprise communication options on the market. Alcatel-Lucent OmniTouch 8600 My Instant Communicator is an innovative solution to this problem, integrating all communication tools to create a homogeneous experience across different devices and channels. 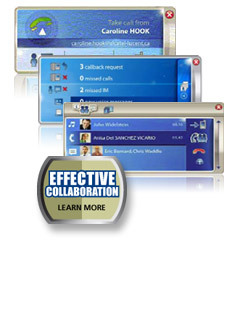 It is the world's first integrated, multi-media, multi-session, multi-device unified communications client solution.